Deal with experienced roofers, not salespeople! Call Stiteler Exteriors for your roof installation or roof replacement today! Choose us for all your roof replacement needs. Update the siding on your house for a fresh look. Install new windows and doors throughout your house. Add the finishing touches to your roof and siding. Paul Stiteler, Wesley, or JoAnn will answer when you call! They are a family that will be happy to help! A roofer from Stiteler Exteriors can make your house look its best. You won't have to worry about leaks in the roof or critters crawling into your attic. A sturdy, seamless roof can shut out intruders and moisture. It will also seal in heat during winter. In addition to providing roof replacement services, we can also work on the metal capping and flashing on your roof. Once we're done, your roof will be watertight and gorgeous. Are you thinking of selling your house? Consider getting a new roof complete with colored shingles designed to accent the color scheme of your house. This kind of home improvement really raises the curb appeal and market value of any home. Call today to speak with a roofer in Egg Harbor Township, NJ. Contact us now to get a free estimate on exterior home improvement in Egg Harbor Township, NJ. As a family-owned business, we've been fixing roofs in the Egg Harbor Township, NJ area for over 30 years. We care about the community we serve, and we're dedicated to making your roof, siding and windows look absolutely gorgeous. Your roof is the first line of defense between your family and heavy rain, heat and hailstones. We'll make sure it's up for the task. Enhance your house with help from a roofer in Egg Harbor Township, NJ. 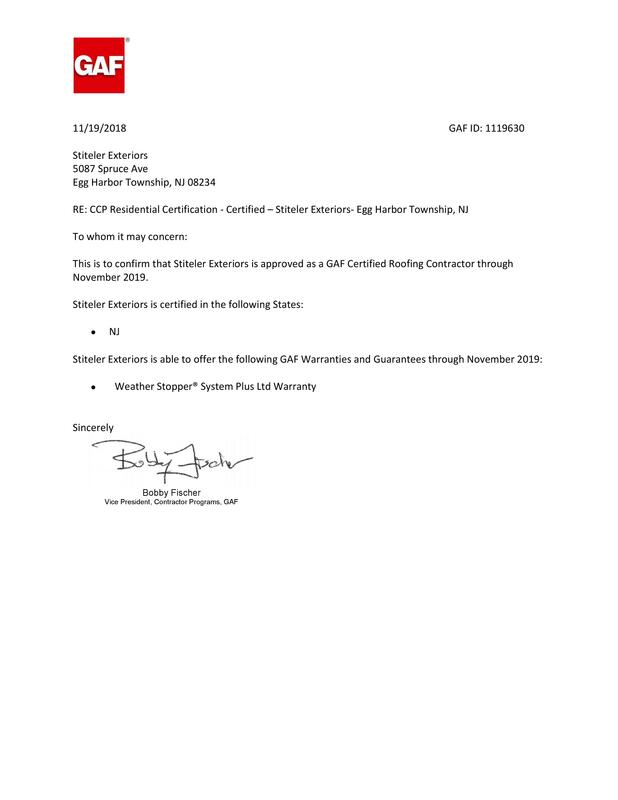 Stiteler Exteriors is now officially GAF Certified. We can now offer the Weather Stopper System Plus Ltd Warranty on your new roof. 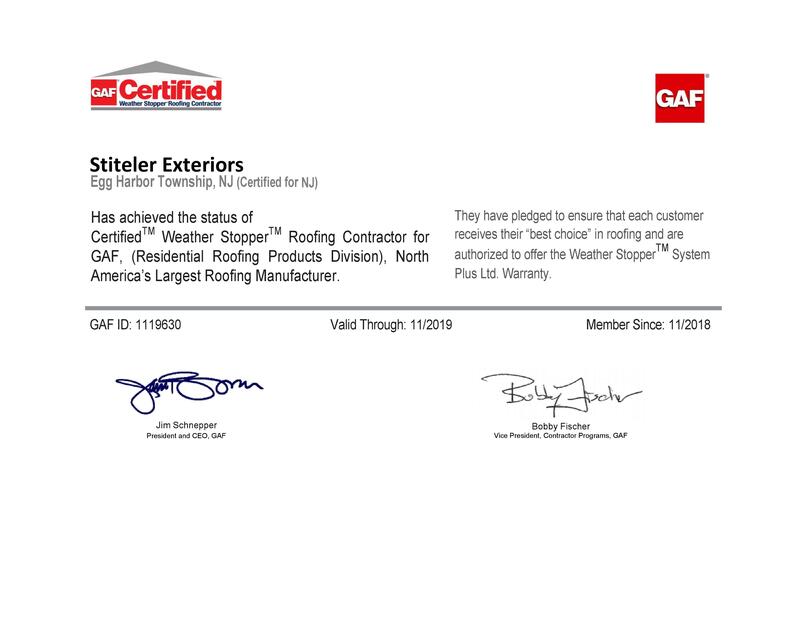 That means you're not only getting our 10 year workmanship but you're also getting backed by GAF's 50 Year Ltd Warranty.